It took me a really, really long time to accept that site speed is one of the most important factors when it comes to increasing traffic to your blog. Google likes it, Pinterest likes it, users like it. Any longer than 3-4 seconds for your blog to load and (supposedly) your traffic starts dropping off by double digit percentage points. That means that for a lot of us, increasing site speed could increase our traffic by double digit percentage points. The pot gets even sweeter from there because most ads run smoother when your site loads faster, so if you’re on an ad network, you could also start seeing higher RPMs. 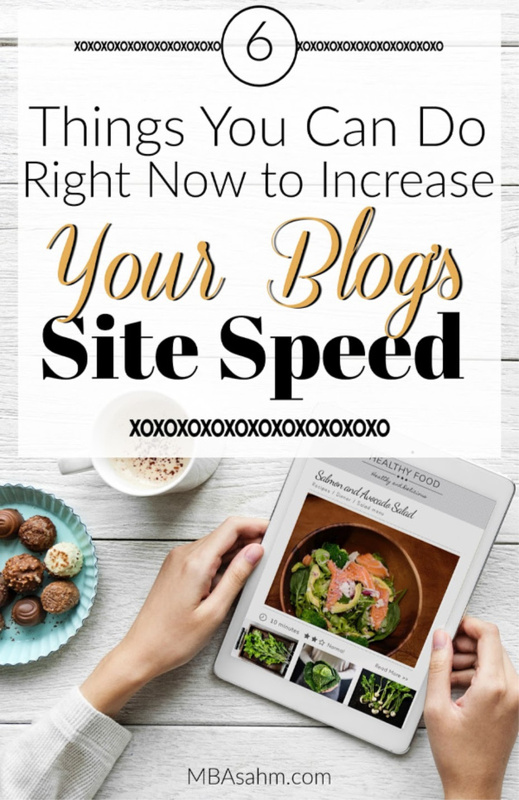 Because site speed is such a critical factor to blog traffic, there are a lot of things you can do, a lot of investments you can make, and a lot of bells and whistles to play with. But more importantly, there are a lot of free, easy, and quick things that you can do right now that will instantly improve your site speed. Before you can get started you need to know how fast your site actually is. Luckily there are quite a few sites that do this for you and they will provide a treasure trove of information to help you pinpoint exactly what is slowing down your site. Each site gives you a different perspective and different information. And while they’re all similar, they will each give you a slightly different site speed. For this reason, I use all of them (they’re all free so you should do the same). Website Grader is clean, easy, and provides the best simplified overview for how your site is doing and where it needs work. This should definitely be one of your first stops! GTMetrix provides a lot of information about your site speed so be prepared to get overwhelmed at first. But I promise you, it will be worth it! It shows you exactly what areas of your site are slowest and the “waterfall” section lists every single thing that needs to load on your site and how long it’s taking (so you may be able to notice so outliers there). Let’s be honest. Regardless of how helpful this tool may or may not be, it matters what Google thinks! I won’t lie to you, I don’t draw too much helpful information here about what I can do to improve, but I always check my site here to make sure Google is happy. If it isn’t, head back to the others to see what they say. Ready to increase your site speed in under a minute? Delete Jetpack. Delete the obscure plugin that makes your background blink. Delete your Recommended Articles plugin. Delete. Delete. Delete. Plugins weigh down a site more than anything. It is the quickest, easiest, and most straightforward way to increase your site speed immediately. It took me YEARS to accept that this was true. I loved my plugins. I loved Jetpack. I loved having 3 different social sharing plugins because they all made the desktop version of my site look so pretty. Now? I love that my traffic is the highest it’s ever been. I love that my ad revenue is salary-worthy. And I love that it actually made no difference at all when I deleted all but one social sharing plugin. And you know why it didn’t make a difference? Because my readers are visiting my mobile site. I’m saying this again in caps – READERS ARE VISITING YOUR MOBILE SITE. If you have a plugin that really only serves your desktop readers, delete it. If you have a plugin that only shows things at the bottom of a post, delete it. If you’re nervous about this, that’s normal. Instead of deleting the plugin, just deactivate it and see how things go for a week or two. If you survived and your traffic wasn’t affected, then send the plugin off to the trash bin! Except that it’s not! Nothing on your sidebar is being viewed. Again – because your readers are on your mobile site. And for your mobile readers to see your sidebar, they have to literally scroll to the very bottom. And they just don’t do that. BUT, despite the fact that they aren’t scrolling that far, your site is still loading all of that information…on every single page, every single time. Your sidebar should contain next to nothing because it is viewed far less than you think. Nowadays, it is nothing more than a glorified footer. On this site, I have my bio, links to follow me on social media, and a search bar. On my other site, I don’t even include the social media links! You will be shocked how much your site speed improves when you start removing things from your sidebar. Images are extremely important for readability and social media, but they can also really slow down your site. You want to be thoughtful about which images you use and always try to make them as small as possible. There ARE plugins that optimize images even further, but I will be honest, I don’t use any of them (for the reasons listed above) and my site speed averages between 2-3 seconds. I do, however, put every single image on my site through PicMonkey and resize the image to a 600 pixel width (for social media) and my feature image is actually only a 200 pixel width. In the beginning, I did NOT do this and it weighed down my site to the point where it would actually be down for a few minutes if I got a nice bit of traffic. Once I realized what was going on, I got busy redoing my images and my site speed improved right away. This is definitely something that can improve your site speed immediately. While images are a critical element of a successful blog, that doesn’t mean that every single image improves your reader’s experience. Again, keep in mind that most of your readers are coming from mobile, so pretty images that are right or left justified on your desktop will often take up the entire screen on mobile. This can be good for SEO, but it can also get annoying for readers if the image doesn’t actually improve their overall experience. Also keep in mind that if you are using an ad network that provides in-content ads, you will already be having “images” throughout your post. Now, these ads obviously don’t improve user experience, but they do provide that break from text and if you are including a lot of images on your own, your readers could get overwhelmed. For these reasons, you should really consider deleting images that aren’t providing a lot of value. Just make sure you have at least one good one that can be shared on each social network (and probably even a little more than that). But no need to go crazy! There are two types of plugins – asynchronous and synchronous. If all of your plugins are synchronous, then your site won’t show up until everything is loaded. If your plugins are asynchronous, your site will start showing up as each application finishes on their own. It can get a little confusing, but the bottom line is – asynchronous plugins improve site speed. It can be hard to know what plugins are asynchronous and which are synchronous, so you unfortunately need to do a little research. If you use Mediavine for your ads (that’s who i use), they have an amazing tool that tells you which plugins are asynchronous and which are synchronous. If you can, use it! Unfortunately, if you aren’t using Mediavine the tool won’t work for you, but they are a great ad network, so they should be your first stop once your traffic hits 25k/month. If you consider these two factors every time you make a change or addition to your site, you’ll be heading in the right direction. 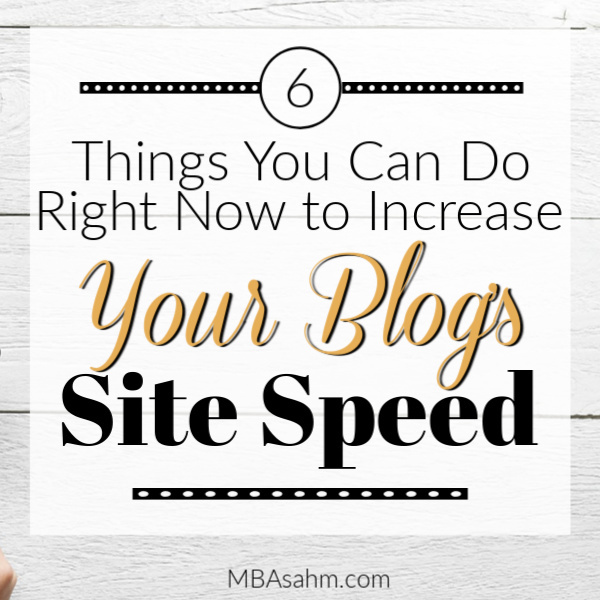 Good luck with your blog’s site speed (and everything else!). Hey Nikki! Thanks so much for the shoutout. 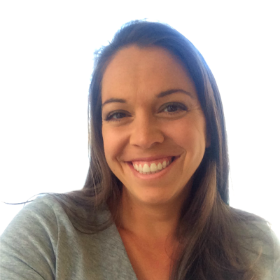 We are so thrilled to have you as one of our publishers! You hit the nail on the head with these awesome site speed tips. Here at Mediavine, we place a big focus on site speed and the best earnings possible without negatively impacting user experience. If anyone has questions, we’re here at publishers@mediavine.com!